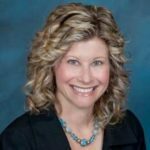 Named “Realtor of the Year” by the Denver Board of Realtors in 2009 and “Broker Manager of the Year” in 2012, Gretchen Rosenberg has 22 years’ experience in residential real estate. She was among the founding agents at Kentwood Real Estate’s Cherry Creek office, and served as the Managing Broker for 11 years until being appointed the President and CEO in 2018. The National Association of REALTORS® has ranked Kentwood Real Estate as one of the top 100 U.S. brokerages for the past five years. Kentwood consistently earns recognition as being amongst the top U.S. brokerages with the highest sales volume per agent. When compared to RISMedia Real Estate Magazine’s 2017 Power Broker Survey, Kentwood ranked #1 in Colorado and #4 Nationally for the highest volume sold per associate in 2016. Gretchen closed more than $200 million in volume during her sales career and attributes that success to a thorough understanding of the Denver market. Kentwood Real Estate is an affiliate of Berkshire Hathaway’s HomeServices of America. Berkshire Hathaway is among the most trusted brands in the world, and that belief in ethical good business filters down to all Berkshire Hathaway companies. Gretchen has served on the Denver Board of Realtors Grievance Committee, International Committee, Roundtable Awards Committee and was a member of the Board of Directors. She was also a member of the Board of Directors at both the National Association of REALTORS® (NAR) and Colorado Association of REALTORS® for nine years and served on the NAR Board Jurisdiction Committee and the Communications Committee. Gretchen was chosen as the NAR President’s Liaison to India in 2015. In 2006, 2011 and 2015 she was invited by NAR – India to be a guest presenter at their annual real estate conference. Educated at the University of Denver, Gretchen obtained her Bachelor’s degree in Public Affairs and International Studies and her MBA with a focus in Marketing. She went on to teach business and creative writing classes as an Adjunct Instructor at the Community College of Denver, and participated in the founding of the Cherry Creek Kentwood office two years after becoming a licensed Real Estate Broker in Colorado. In her leisure time, Gretchen enjoys the Colorado lifestyle: skiing, bike riding, walking the dog and reading a good book in the back yard. She was nominated to the Board of Directors to HomeAid Colorado in October 2017. Over the years, Gretchen has volunteered with and/or supported: Meals on Wheels, The Women’s Foundation of Colorado, ACE Scholarships, The Children’s Hospital Foundation, Women for Women International, HomeAid Colorado, The American Cancer Society, Foodbank of the Rockies, The Denver Dumb Friends League, St. Jude Children’s Hospital, The Autism Society and UNICEF.